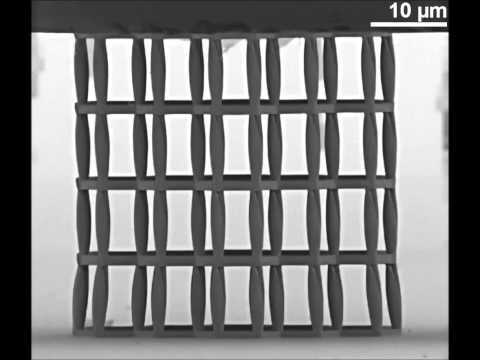 Researchers at the Karlsruhe Institute of Technology, led by Jens Bauer, believe such 3D printers may help craft a new generation of materials lighter than water and strong as steel. Today, the sturdiest materials tend to be the densest (like metals), and the least dense materials tend to be the weakest (like foams). Ideally, materials are both lightweight and strong. A rocket’s skin, for example, needs to contain a column of super-pressurized fuel and at the same time weigh as little as possible. As it turns out, some of the strongest, least dense materials aren’t manmade at all—they’re naturally occurring. Wood and bone, for instance, are both strong and light. The reason? On molecular scales, they’re riddled with holes. Like arches in the Roman Coliseum, the shape of all those tiny spaces maximizes strength and minimizes material. The resulting structures are, of course, immensely useful. Bird bones, for example, are strong enough to support muscles and ligaments and, at the same time, lightweight enough to permit flight. Hexagonal micro-truss structure about 30 millionths of a meter wide. Although bone and wood are already strong and light, nature’s design can be refined. Inspired by organic materials, Bauer and his team set out to build the strongest, lightest materials they could. But how to build the equivalent of Roman arches into a material on near-molecular scales? Previously, there was no answer. Now, there’s the Nanoscribe 3D printer. The printer’s mirror-focused laser shines on and hardens a droplet of liquid plastic on a slide. A computer moves the plate under the laser, selectively hardening it, layer by layer, to match a digital 3D model. Once complete, the excess liquid is washed away, leaving a pristine structure—with features a few millionths of a meter across. Bauer’s team experimented with a variety of micro-truss structures like those pictured above. Such materials would not have been possible even a few years ago. Microscale 3D printing is still new, but it’s quickly progressing. In 2012, researchers at the Vienna University of Technology 3D printed a race car and cathedral smaller than a dust mite. A year later, Nanoscribe printed models of about the same size, only four times faster. Though there isn’t yet a good way to cheaply scale the process up to an industrial level, it’s a fascinating peek into a future where information technologies may direct the fabrication of amazing new “microarchitectural” materials. And indeed, it may not be the only new computer-enabled approach to materials research. In a recent article, Scientific American predicted supercomputers “will yield a Golden Age of materials science.” The article went on to note that the powerful modeling capabilities of supercomputers and the principles of quantum mechanics are together allowing scientists to build virtual materials atom by atom. Whereas, in the past, researchers had to go through a laborious, sometimes decades-long process of trial and error, such “high-throughput materials design” would sort through hundreds or thousands of theoretical materials, cherry picking the ones with the most promising properties before ever conducting an experiment. Our world relies heavily on useful materials, from the filament in a light bulb to the silicon in a computer chip. Whether we 3D print them or assemble and sort the vast possible molecular permutations by supercomputer—or both—the discovery and implementation of new super materials may soon kick into high gear.